Having a fitness treadmill at home is the ultimate in keeping up a cardio fitness program come rain or shine – no more battling your way to the gym or coping with overcrowded machines. You can jump on your treadmill any time you have a few minutes and use it for anything from a gentle walking program to a full-out athletic training regime. If you can only choose one piece of exercise equipment (and you have the space – and funds for a quality machine), a treadmill is a great choice in home fitness equipment. How do you choose treadmill fitness equipment from the whole range out there? Buying a treadmill is not exactly an everyday purchase so most of us need quite a lot of information about the various fitness treadmills available before making a decision to buy one. That’s where we can help you. If you want to find out which treadmill equipment is right for you, you’ll find the main areas to look for when choosing a treadmill in the checklist below. But if you want something much more in depth see our FREE treadmill buying guide and consumer report where we bring you 17 pages of the very best “no stone left unturned” INDEPENDENT information about selecting a treadmill to suit your requirements. Treadmill prices range from about a hundred dollars to well over five thousand. Although you can buy high quality robust treadmills which are meant for commercial gyms as home gym exercise equipment, there is a whole category of treadmill exercise equipment which will last for years of home use and is much less expensive. It makes sense to choose for the amount of use that the machine will get rather than to pay too much. If your budget is very limited you can buy a manual treadmill (for example the Fitness Quest Manual Treadmill which costs about $120 whereas an electronic treadmill of any quality starts at over $500) but of course your treadmill fitness program will be quite limited if you do this. Manual treadmills are hard to get moving and may put a strain on your joints. Instead of choosing this option you may find that you are better looking at a less expensive piece of fitness equipment such as an exercise bike or continuing to exercise in the great outdoors while you save up to buy the treadmill exercise equipment you really want. So many people who have used a treadmill at the gym are disappointed when trying out their new treadmill purchase for the first time. Whatever you do, do not buy one of those cheap treadmills you can get from discount stores and mail order ads – a good machine will not be cheap and for once, with a treadmill you really do get what you pay for. See your treadmill as an investment and spend as much as you can to get a robust design and quality piece of equipment which will serve you and your family for years to come. If you are using your treadmill for running rather than walking or slow jogging you will need to choose one of the models with a larger running deck. Always note the measurements of any treadmill you are considering to make sure you have enough room for your new equipment. If space is limited take a look at the available folding treadmills. Most manufacturers have this option. Although some are less robust than their non-folding counterparts there are a few which are well worth buying if space is an issue. The only figure worth looking at when assessing a treadmill motor is the continuous duty rating which shows how the machine will perform when being used at speed by the heaviest user it is designed for. If the continuous duty rating is not specified, any figure given for power or speed of treadmill motors means absolutely nothing in practical terms. Dig further or leave well alone. You need at least 1.5hp continuous duty to be able to run on your machine. Most motorized treadmills come with a way of changing the incline. This helps add variety to your exercise session and intensifies the workout. Treadmills at the lower end of the range may have just one or two settings which you need to stop and adjust manually. With the best treadmills you can set the incline level automatically up to a maximum of 10-15%. Programs help to keep your treadmill workouts interesting and hopefully keep you motivated to use your treadmill more often. The best treadmills have a variety of pre-set and also customizable workouts and some even have an in-built heart rate monitor which allows for heart rate controlled workouts. You will often find special programs for weight loss too. Of course it generally means the more program options there are, the more expensive the machine – so if a few basic options will suit you and your family there’s no need to go for a machine with more sophistication than you will ever use. A treadmill TV might sound like a fantastic idea but don’t be pulled into buying a particular machine for this kinds of extra unless it needs to be integrated. Focus more on getting the right basics for your money. You can buy a TV separately (and probably for less cost) and watch it during your treadmill workout. Any treadmill advertised as light and portable is not going to be robust enough for a proper workout. A running treadmill (or even a walking treadmill for that matter) needs to be heavy to provide stability. Folding treadmills generally have wheels and are therefore portable to a certain extent but they should not be light. If a machine has anything less a year’s warranty, stay well clear (some manufacturers obviously think their cheap treadmills will only keep going for 3 months). Two to three years is better and you will often find with the better treadmill brands that you get a lifetime warranty on the framework. With exercise treadmills you are better to go for a well-known brand – with a good reputation to uphold. Choose a brand with a decent after-sales service and easy availability of parts. Horizon fitness treadmill Competitvely priced and feature rich treadmills although there may be some issues with build quality. Our treadmill ratings and reviews for individual models will allow you to easily compare the treadmills which you might be considering buying. If you want to save time and concentrate on a shortlist of quality treadmills you can see our pick of the best home treadmill for various budgets from a range of trusted manufacturers on our Best Buys treadmills page. Like all our fitness equipment reviews these are based on our opinion of the best available equipment taking into account all information available from the manufacturers about specification and features and the opinions of those who have bought and used the treadmills themselves. Select from those with a high treadmill rating if you want to be happy with your purchase but also be sure to take into account your own requirements when doing a treadmill comparison. As usual, there is no “one size fits all” when making a major purchase like a treadmill. Compare treadmills with your own needs in mind and with a realistic view of what is available for your budget and you’ll make the right choice. There is nothing like actually trying a treadmill out for knowing that you will be happy with your purchase so if you can find a store locally with a huge range of treadmills to offer you may be better off going there. But these stores do tend to be few and far between, treadmill prices are generally higher due to greater overheads and the choice is often sadly lacking – not to mention that you will probably be subjected to the hard sell of a pushy salesman. Buying a treadmill online is the easiest way to explore the full range of options at your leisure and to make sure that a treadmill has all the features that you require before buying. 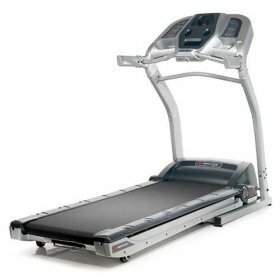 For advice about treadmill troubleshooting and maintenance see the manual which comes with your treadmill. Looking after your treadmill will prolong its life and help prevent costly repairs and annoying downtime. What Do You Think Of Your Treadmill? If you have a treadmill, why not tell us what you think of it on our treadmill reviews page? This helps keep manufacturers and their customer service departments on their toes and helps everyone purchase fitness equipment that is good value for money.